Plus optional extra pre week in the Philippines. I know we said it was the last trip but we had so much fun we just have to do it agaIn - So TAL Scuba is pleased to announce that we have again booked the Odyssey Liveaboard in Chuuk / Truk Lagoon - (We have the whole boat same as the last 3 trips!). 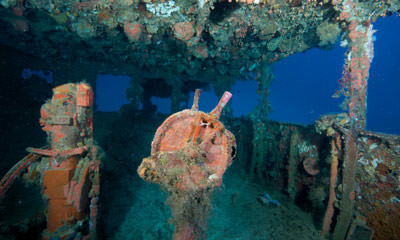 We will be diving some of the best wrecks in the world! But it is not just wrecks, the Fish and Coral life are also incredible, and let's not forget the sharks. Truk Lagoon - A small atoll in the Central Pacific, part of the Federated States of Micronesia, with constant average temperatures of 25 - 32 º C both on the surface and in the water! It became famous in the Second World War when during Operation Hailstone the United States sank 12 Japanese Warships, 32 Merchant Ships and a total of 249 aircraft were destroyed. - In Short the majority of the Japanese auxiliary fleet! Massive shipwrecks (60 + ) including destroyers, freighters, and gun boats. Not to mention submarines, flying boats and the odd plane wreck!! Huge amounts of swim throughs and wreck penetration, allowing you to see the remains of the fleets operations. Peering in the holds you can see row upon row of fighter aircraft, tanks, bulldozers, motorcycles, cars, and railroad equipment. Munitions galore, including torpedoes, containers of ammunition, radios, more weapons than you could imagine, plus the billions of personal and smaller items carried for the troops aboard. And for the non-wrecky type there is masses of fish life, including Manta rays, sharks, and fish galore! "...seeing is believing, words can not describe how awesome it really is!" We have booked the whole of the liveaboard Odyssey. The best liveaboard of the lagoon! Not all sites are visited every week. Weather, water conditions, dive skills and experience and guest requests are all taken into consideration on planning the particular itinerary of each trip. Truk’s finest liveaboard vessel, you’ll find world class amenities and awesome service. 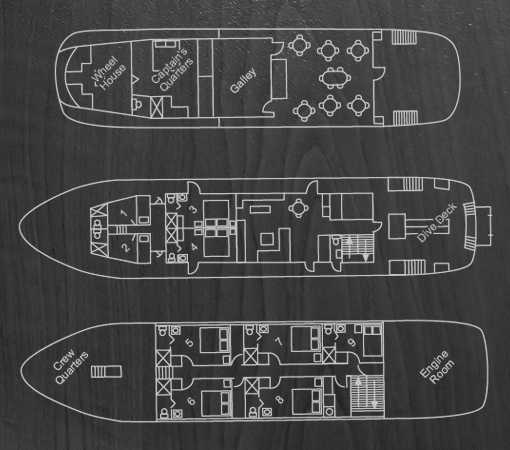 The dive deck is located to the stern of the main deck, and has individual tank ranks, seats and storage facilities. Most diving occurs from the ship therefore you can leave your equipment set up during your stay. After your dive, you can rinsing off under the fresh water showers. The day aboard begins at 7.00am with a hot breakfast and the first dive briefing on the sun deck at 7.45am. Usually you are able to have 2 dives before lunch, where you will usually move to a new site. After lunch there is the option to do another dive or relax on the sun deck and usually a late afternoon dive is available. Around 6.30pm is dinner and then you can relax in the lounge with a movie or you may have the option of a night dive. However, there is no typical day aboard The Odyssey, and schedules will vary depending on site, and requested activities. We have the whole boat, so can choose the best bits! Single Supplement £100, only 2 single cabins. Allow a minimum of 12-14 Days depending on flights, Options and Stop Overs, (Of course more if you choose to add the extra week before or after). You can book your own flights or we can arrange. Balance of approximately £935 due by 1st December 2019 (Final balance will depend on USD exchange rates at the time each payment is made to the Odyssey). Flight costs will need to be paid at time of booking the flights.